The whining began mere moments after Facebook announced it was gobbling up Oculus Rift for a whopping $2 billion, enthralled by the Rift's potential for non-gaming applications. No, I'm not talking about howls of despair from hopeful gamers who see this deal as the equivalent of Luke joining the Dark Side, rightly or wrongly. (I'm on still the fence about that myself.) 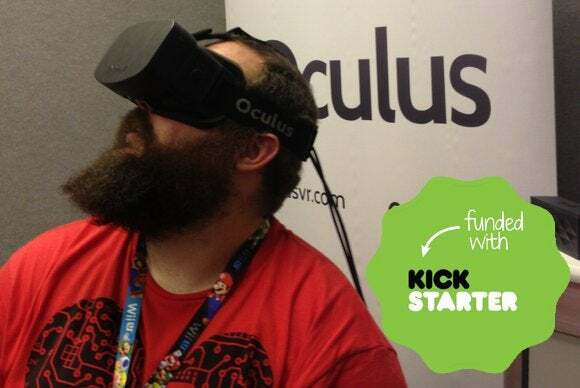 I'm talking about the cynical jabs at Kickstarter and the $2.4 million Oculus raised there less than two years ago. The fallout began immediately. Publication after publication wrote about Oculus's Kickstarter backers not receiving a slice of the $2 billion pie. Prominent gaming figures like Markus Persson and Max Temkin railed about the Kickstarter "investment round" and how an "implicit promise of such a campaign" is freedom from corporate overlords, respectively. The less said about backer comments on Kickstarter, the better. And around it all darted comments about Kickstarter being a store, not an investment house. So many smart people—and quite a few less-thoughtful types—all proving that the world still doesn't understand the point of Kickstarter. Kickstarter itself is very upfront about what it is not. Kickstarter is not a store. Kickstarter is not a venture capital hotspot. Kickstarter is a vessel for breathing life into rad ideas, the far-out, creative endeavors that often struggle to find money elsewhere. Kickstarter is about funding hopes and dreams. The first thing you see on Kickstarter's homepage. Consider the Oculus Rift itself: The idea of affordable and useable virtual reality seemed downright insane just two years ago; most VR experiences up to that point cost into the quadruple and quintuple digits and were utterly, deeply janky. Palmer Luckey and the Oculus VR crew thought they were on to something, though, and asked for a mere $250,000 on Kickstarter to get the vision off the ground. More than 9,500 backers believed in what mainstream investment sources would only scoff at, pledging a whopping $2.4 million in total. Oculus VR had the cash it needed to roll the dice on Luckey's vision. That is what Kickstarter is for: Helping far-fetched dreams to become grounded in reality. Yes, Oculus Rift backers received a nifty VR headset—a glimpse into the future, if you will. And yes, Oculus VR the company wound up with Facebook money—the bigger, badder cousin of YouTube money. Neither was guaranteed; Kickstarter is neither a store nor a venture capital wellspring, remember. But against all odds, Oculus succeeded, and everyone—backers, founders, you and me, everyone—are on the brink of bathing in the success of the core idea behind the Rift, an idea that seemed so ridonkulous mere months ago: Affordable, believable virtual reality. Oculus also lit a fire in the world of technology. Beyond the Rift, hordes of other start-ups are building VR interpretations of their own, often with very different takes than Oculus. Heck, even Sony is building a VR headset for the PlayStation 4 with Project Morpheus. Journalist Nonny de la Peña's "Hunger in Los Angeles" uses the Oculus Rift to put you in the role of an observer at a food bank line marred by tragedy. It re-creates an actual event and uses audio captured at the scene. That is the true success of the Oculus Kickstarter campaign: Imagination literally given (digital) flesh, an idea that spread like a virus and could one day help the injured heal, teachers open minds, and journalists drop you into the scene of triumphs and tragedy. No, Kickstarter is not a store or an investment house, despite what so many seem to think. It's so much more: an incubator for dreams. The Oculus Rift is a paladin for that potential, regardless of what you think of Facebook's multi-billion buyout.